An Arc Flash is an energy discharge that forms when a fault occurs in an electrical circuit. The arcing fault results in a tremendous amount of energy released as current flowing through ionized air. It is not necessary to touch live components to sustain an arc flash injury. Arc Flash is not shock. 5 to 10 arc explosions occur in electric equipment in the U.S. every day. More than 2000 people are treated annually in burn centers with arc flash injuries. Electrical arcs produce some of the highest temperatures known to occur on earth. Up to 35,000 degrees Farenheight, which is 4X the temperature of the surface of the sun! All known materials are vaporized at this temperature, which causes a sudden expansion of air. Blast pressure waves have thrown workers across rooms. Arcs spray droplets of molten metal at speeds that exceed 700 MPH. Blast shrapnel can penetrate the body. Molten metal from an arc can be propelled for distances up to 10 feet. Even when several feet from the arc, fatal burns can occur. Clothing can be ignited from 10 fet away. Clothed areas can be burned more severely than exposed skin. The arc blast can have a sound magnitude of 140dB at a distance of 2 feet from the arc, resulting in hearing loss. Arc Flash can be caused by something as simple as a rodent, tool or other element in the breaker area that compromises the distance between energized components. Two out of three electrical injuries are a result of inappropriate action of a worker. 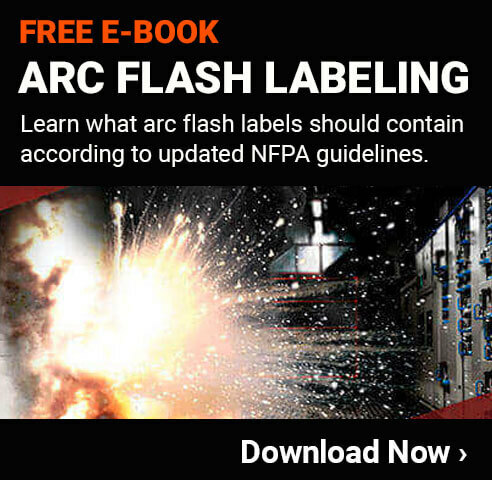 As your ARC FLASH LABELING EXPERTS, we have all the tools you need to properly label equipment for Arc Flash Hazard. We also carry Lockout/Tagout products and PPE. Take the proper precautions, be standards compliant, and reduce the risks of injury and death. We are the leaders in visual safety! An arc flash is a dangerous discharge of energy from an electrical circuit that can result in severe burns, hearing loss, and even death. An arc flash event can occur suddenly, causing injury even if people aren’t touching any of the electrical equipment involved. This infographic lists 10 facts about arc flash that people who work around electrical energy should know. Read and share to spread the word about the danger of arc flash.